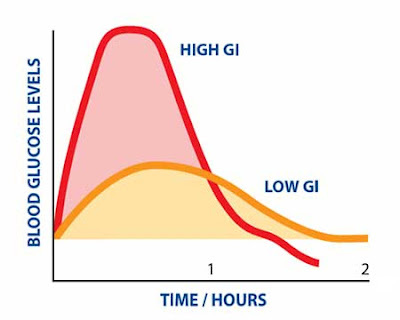 The glycemic index (GI) is a numerical scale to determine the speed at which certain foods raise blood sugar levels - low, moderate or dramatically. Food which has a GI 1-50 is said to have a low glycemic index, GI 50-75 indicates moderate, while GI 75-100 indicates a high value. Scientific research over three decades has shown that not all carbohydrates act the same way: blood sugar behaves differently depending on the type of carbohydrates that we consume. Ice cream which contains sugar, is less affected by the rise in blood sugar levels than white bread, this was published in 1981, glycemic index is represented by two capital letters; GI. Why is it good to now the glycemic index of foods that we consume? If you know well your glycemic index of foods blood sugar levels can be kept under control and thus act preventively in diseases of the heart and blood vessels, type 2 diabetes, insulin resistance, also we can regulate the level of cholesterol and triglycerides in the blood. Diet based on foods with high GI is associated with the occurrence of other diseases and disorders- such as infertility, age-related macular degeneration and colon cancer. In the event of a sudden increase in blood glucose, increased pancreatic insulin-producing, which allows glucose to enter the cells, where it is converted into energy. When the blood has a lot of insulin, the need for eating sweet and starchy foods is becoming more and more frequent, resulting it to easily convert to fat and prevent melting earlier created fat. Earlier it was believed that starchy carbohydrates are absorbed and digested very slowly, but t hose from sugar lot faster. This is not fully correct. We will give you one example: why mashed potatoes and soft drinks have very similar glycemic index. How? Namely: the manner of processing, forms of foods, types of fiber, sugar and starch as well as the method of preparation - affect the final glycemic index of groceries. Integral grains are digested slowly or after processing (milled, baked), become very easily digestible and excellent for our digestive tract and are recommended for the treatment of constipation (oatmeal, etc.). Again, people who want to regulate blood sugar, cholesterol, etc. should eat less processed foods with lower GI. So integral and white bread have a high GI, while the bread of several types of grains have a middle level of GI. Besides oats which we have already mentioned, apples and beans are rich in fiber and slow the passage of food through our transient tract and these foods have low glycemic index. Blood sugar is affected by the intake of foods containing carbon hydrate. Most of such foods we consume through snacks or main meals and we do not consume them independently. Let us say we combine potatoes with meat and other vegetables, bread with butter and other. Presence of foods rich in proteins and fats, significantly slows digestion and lowers our overall GI. Some basic guidelines are to eat more whole grains, because of the fact that the fiber in them takes longer to digest and therefore causes considerably smaller sugar jumps. Fiber food is contained in vegetables (legumes, nuts, seeds) and fruits. We also provide evidence that low glycemic index is contained in protein foods such as fish, lean meat and dairy products. Fats dl not affect significantly the level of glucose in the blood, but be cautious because of the risk of obesity and effects on the cardiovascular system. If you combine foods with high glycemic index and those with a low GI you balance insulin levels. Fruits with a low glycemic index are mainly citrus fruits, since they contain a much lower GI than other fruits, so be sure that you have it in your daily menu, if you want to keep your health in general. The real image is given by a glycemic load (GL), which refers to the composition and size of meals that are consumed, and obtained when multiplying the glycemic index of the carbohydrate and the result is divided by 100. For example - the carrot has a high GI, but also all 3 grams of carbohydrates! Therefore, it is unlikely that someone will eat 15 carrots and thus cause a sudden jump in blood sugar. 2-3 carrots will not have a significant impact on blood sugar levels. On the other hand, the paste has a moderate glycemic index, but we will eat more, and therefore there is a greater chance that it will cause a sudden increase in blood glucose.